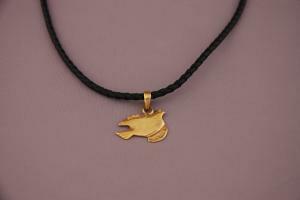 The Peace Dove necklace is quite literally the bomb. Each one is handmade out of bombshell casings from Cambodia and sell for $45 through Ten Thousand Villages (www.tenthousandvillages.com). The Cambodian Fair Trade artisan group Rajana purchases the casings from the Halo Trust organisation, a non-governmental organization (NGO) that specialises in the removal of the hazardous debris of war, as well as from fishermen who find bomb cases and bullet shells at the bottom of the Mekong River. The doves are hand cut using jeweller’s scissors and then hand stamped with the word “peace” in Cambodia’s native Khmer and English. Rajana provides skills training and income generation opportunities for young Cambodians. The organization, which began in Phnom Penh in 1995 with the help of international NGOs, today is fully owned and operated by Khmer people. Rajana also works with 122 families in Cambodian villages, training young people in craft production, marketing, computer skills, accounting, and English. Cambodia has the highest proportion of amputees in the world. The country is still littered with landmines, which are triggered by unexploded ordnance and shell casings from the conflicts that took place from the 1960s to the 1991 peace settlement. Landmines continue to take the lives and limbs of Cambodians, who struggle with poverty, a fragile legal and justice system, and poor education and health services. During Ten Thousand Villages Canada’s Peace Dove Necklace Campaign, which ran from the International Day of Peace (Sept. 21) until Remembrance Day (Nov. 11), $5 from each necklace sold was donated to Mines Action Canada. Eight hundred and eighty one necklaces were sold, raising $4,405 to buy wheelchairs and bicycles for children who have been disabled by land mines.